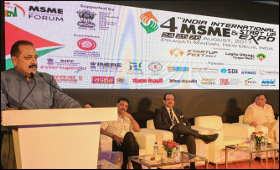 The Minister of State for Development of North Eastern Region (I/C), Prime Minister's Office, Personnel, Public Grievances & Pensions, Atomic Energy and Space, Dr. Jitendra Singh has inaugurated the 3-day 4th "India International MSME and StartUp Expo 2017", in New Delhi on Thursday. While addressing the gathering, Dr Singh has called for indigenous "StartUp" initiatives. Dr Singh said, "Prime Minister Shri Narendra Modi's "StartUp" initiative has the capacity to open new avenues of employability. At the same time, one can also serve the rich cultural and traditional heritage of India if we focus on "StartUp" ventures through indigenous resources and means." Citing example, he said, for instance, the pieces of artisan excellence prepared by some of the creators which are on display in the exhibition stall, were completed after several months of labour but could fetch very little on sale because of lack of value addition and partly lack of awareness. "Other aspect of concern is that such streams of art were being kept alive by certain "Gharanas" or "Khandaans" but with the next generation youth opting for hi-tech professions, there is nobody to carry forward this original indigenous vocation," he added. Dr Jitendra Singh stated that just as in Northeast, the Ministry of DoNER has taken the initiative of offering "Venture Capital Fund" to any young "StartUp" who wishes to set up a unit in one of the North-Eastern States, similarly the respective State Governments could also come forward with certain specific and exclusive incentives for youngsters who undertake "StartUp" initiatives in the field or discipline which traditionally identifies with the culture and heritage of that particular State. Uttar Pradesh Industry Minister Satish Mahana and Chairman MMTC (Mineral & Metal Trade Corporation) Rajnish Goenka also spoke on the occasion.